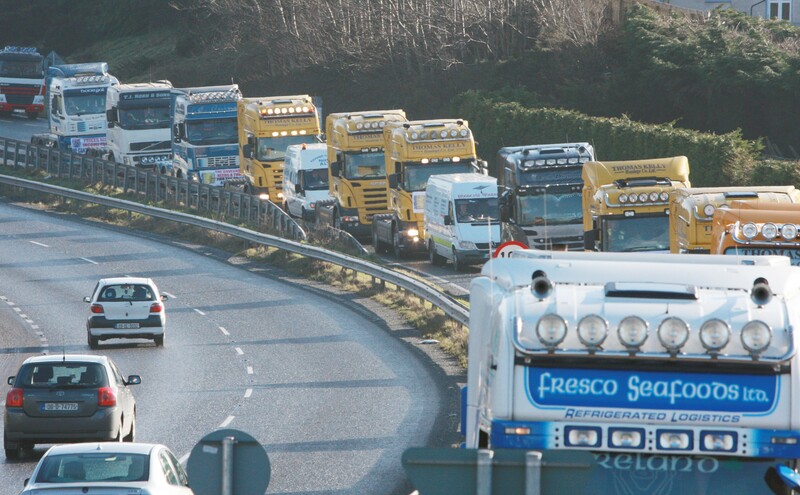 EXCLUSIVE: DONEGAL truckers behind a plan to bring Dublin to a standstill are to go ahead with their plans next week – if they can outfox Gardai. However we have also learned that senior Gardai in Dublin have set up a special team to track the movements of the truckers in an effort to prevent what they believe would be an illegal blockade. They have sent out an alert to gardai here in Co Donegal and in several other counties where there will be a bid to prevent large numbers of haulage drivers from getting anywhere near the capital. Support for of a mass haulage protest increased after talks between reps and TDs failed to reach a conclusion. Fuel prices and laundered fuel were the main topic of conversation on the agenda and IRHA president Eoin Gavin admitted that the protest was now a distinct possibility. “There appears to be no other option but to proceed with our proposed protest action on the week of the 20th of February in order to draw public attention to the Government’s willingness to fuel criminality and the resultant decimation of the haulage industry in Ireland,” said Irish Road Haulage Association president Eoin Gavin. It will be a year next Wednesday since hauliers held a protest in Letterkenny.